How to Cut Fabric with Cricut Tips and Tricks - Sew What, Alicia? This is a question I get all the time! I cut fabric with my Cricut each and every week (almost daily) and so I have learned a few tips and trips for how to cut fabric with Cricut. Today I am sharing them all with you. If you are on the fence about getting a machine or not sure which machine will meet your fabric cutting needs then read on. 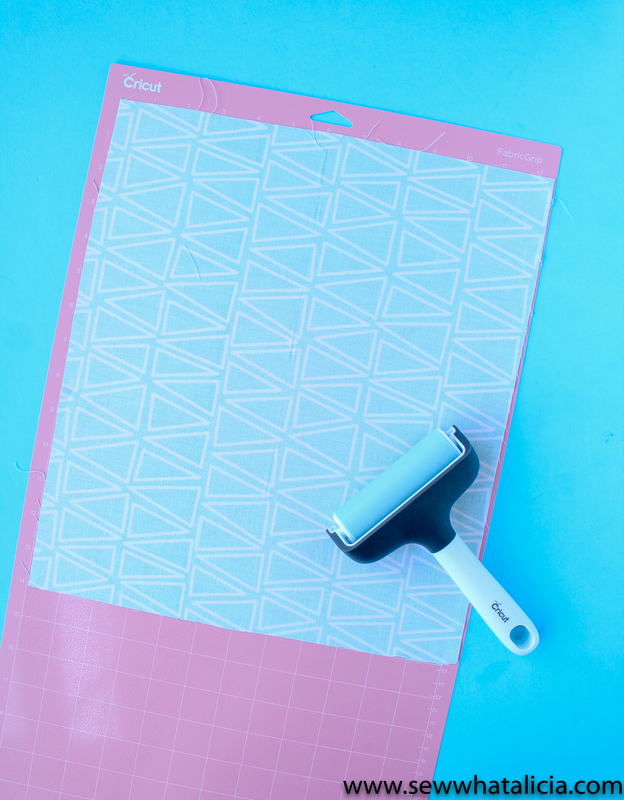 I have everything you need to know about cutting fabric with your Cricut cutting machine. Yes! There are several great options for cutting fabric with the Cricut. The Cricut Explore Air 2 and the Cricut Maker are the machines that I have and use, so I will chat about each of these machines in this post. I have not used the earlier explore machines but if they accept the bonded fabric blade and the fabric grip mat (linked below) I don’t see any reason why they would not work exactly the same as the Explore Air 2. Looking for ideas of what to cut? Check out these amazing cut file bundles. Can the cricut explore air 2 cut fabric? The short answer is YES. The EA2 can cut fabric. To cut fabric with the EA2 you should use a Fabric Grip Mat and a Bonded Fabric Blade. Another of my favorite tools that I highly recommend is the brayer. This helps you to get the fabric to lie flat and remove wrinkles. How do you bond fabric with cricut? There are several options for creating bonded fabric with the Cricut. First you can purchase bonded fabric directly from the Cricut site, HERE. Cricut calls it Fusible Fabric, this just means that it is ready to fuse to your project once it is cut. The great thing about the fusible fabric from Cricut is that it is already sized to fit directly onto the fabric mat. So if you are feeling truly lazy (like I often am) the fusible fabric is a good option because it is already bonded and it is the right size. Want to bond your own fabric? No problem. There are a few options for bonding your fabric. If you want to apply your image without sewing Heat N Bond Ultra is my go to. If you want to apply it and then sew it on Heat N Bond Lite is the way to go. Heat N Bond Ultra – This is a heavy duty double sided adhesive. You can use it on lots of different types of fabrics (including felt) to create a bond for cutting your fabric on the Cricut Explore Air 2. Heat N Bond Lite– This is a light weight double sided adhesive that is meant to be fused to the fabric and then adhered to the project. Then it can and should be sewn over to form the permanent bond. Freezer Paper – Freezer paper can be pressed to the back of the fabric to give it some stability. Freezer paper is a good option when you don’t want the fabric to be bonded permanently. If you are cutting the fabric to create something soft like a stuffed toy that doesn’t require stability you might want to be able to peel the bonded section away after the fabric has cut. What cricut cuts fabric (best)? Hands down my favorite Cricut for cutting fabric is the Cricut Maker. Why? Because of the rotary cutter and because I don’t want to bond the fabric each time. The rotary cutter means that I can cut detailed images into the fabric in a way that the straight blade just isn’t able to do. You can see how precise and clean the rotary cutter cut these ballerinas using the Cricut Maker. I have cut so many detailed and amazing things using my Maker. Get more tips for using the Maker for sewing HERE. So…Do cricut machines cut fabric? Yes, obviously, they most certainly do. I use them to cut fabric every single week (almost daily). There are a few small issues, such as you do get a bit of fraying on the edges of the fabric when removing it from the mat. Using a tighter weave will cut down on the fraying. This spatula also helps to cut down on fraying by getting underneath the fabric to make it easier to remove. But I find that the small amount of fraying rarely messes with the project I am making. The fraying is always less than the 1/4″ seam allowance I am typically using so it is a non issue for me. The mat can be a tad sticky when you first take it out of the packaging. Press it to your shirt to give it a layer of lint and remove some of the stickiness. Use the brayer to make sure the fabric is well adhered to the mat and remove wrinkles. Another great perk is in the Cricut app. It is called Snap Mat. You can read all about how it works HERE. Snap mat allows you to take a photo of your fabric so that you can fussy cut your design. This is super helpful because when you have a beautiful fabric pattern you want to make sure that you are cutting your design in the right place. Can cricut cut felt fabric? It sure can! This post HERE goes into much more depth about cutting fabric and has all the tips and tricks you will need to cut felt fabric. Felt is one of my absolute favorite things to cut with the Maker. It is SO easy to do and it gives it such a nice clean edge. Felt is a great material to work with because it is so forgiving. I LOVE working with felt. So will you be cutting fabric with your Cricut? Share with me in the comments below if you have any more tips, tricks, or questions about how to cut fabric with Cricut. Want to see some fun projects using the Cricut? Find all my Cricut projects HERE.